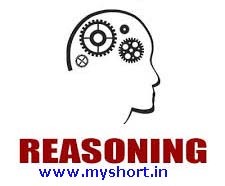 Reasoning Related Most Question With Answer Set 27 Current Affairs, Aptitude And Join the best Online Test Series & get all India Rank, Logical Reasoning. Logical Problems · Number Series · Verbal Reasoning and important Question & Answer with solution & Formulas in Hindi & English And Important Questions with Answers to Numerical Ability asked in Gramin Bank Office Assistant Exam And These all questions will very helpful to you for the forthcoming Bank exams, SSC CPO SI Delhi Police and Rajasthan Police and All Competitive Examination. A * B’ means ‘A is neither small nor equal to B’. ‘A © B’ stands for ‘A, B is neither big nor equal’. A $ B’ is not meant to be ‘A, B is neither big nor small’. ‘A @ B’ का अर्थ ‘A, B से बड़ा नहीं है’. ‘A % B’ का अर्थ ‘A, B से छोटा नहीं है’. ‘A * B’ का अर्थ ‘A, B से न तो छोटा है न ही बराबर है’. ‘A © B’ का अर्थ ‘A, B से न तो बड़ा है न ही बराबर है’. ‘A $ B’ का अर्थ ‘A, B से न तो बड़ा है न ही छोटा है’. In each of the questions given below, four statements indicate relationships, which are followed by the four findings I, II, III and IV. Assuming all statements as true, find out which conclusion is definitely true. नीचे दिए गए प्रत्येक प्रश्न में चार कथन संबंध दर्शाते है, जोकि चार निष्कर्षो I, II, III और IV द्वारा अनुसरण किये जाते है. सभी कथन को सत्य मानते हुए, ज्ञात कीजिये कि कौन सा निष्कर्ष निश्चित रूप से सत्य है.